Identify overheating equipment in plants, substations and towers during routine inspections using a thermal sensor. Increase the accuracy of flood risk assessments by combining bare earth topographic models and vegetative analysis using a multispectral sensor. Use a hyperspectral sensor to capture data related to environmental protection activities such as tree health, water quality assessments and plant counting. Record as-built information and streamline site planning by capturing the exact detail of the ground, soil excavation, buildings and existing structures with a LiDAR sensor. Protect against yield loss through the early detection and identification of diseases by employing a hyperspectral sensor. To meet the growing needs of their organizations, enterprise leaders are seeking new and richer data. Data that reveals hidden phenomena, brings clarity to complex issues, and empowers decision-making for mission-critical operations. As a result, those responsible for delivering data to their organization are striving to go beyond the limits of existing methodology. They understand the need to innovate within legacy systems, without disrupting operations. Geospatial and aerial intelligence are no exceptions. Despite recent advancements in traditional data collection technologies, limitations persist. For instance, commercial satellite imagery has a maximum spatial resolution of ~35 cm. The cost to deploy a manned aircraft for aerial collection remains prohibitive for most small-to-medium-sized missions and is not well-suited to areas of interest with obstructions, such as dense foliage, cloud cover or tall structures. Unfortunately, you can't just put a sensor up in the air, collect data and reach the right outcome. Improved sensor quality: The ground sample distance of DJI’s standard visual sensor has halved since 2013. Increased point density: In 1996, LiDAR outputs averaged 1 point every 2-5 meters. Drone-based LiDAR is achieving 100-500 points per meter. Decreasing sensor size: In 1997, the average airborne LiDAR weighed 81.6 kg. 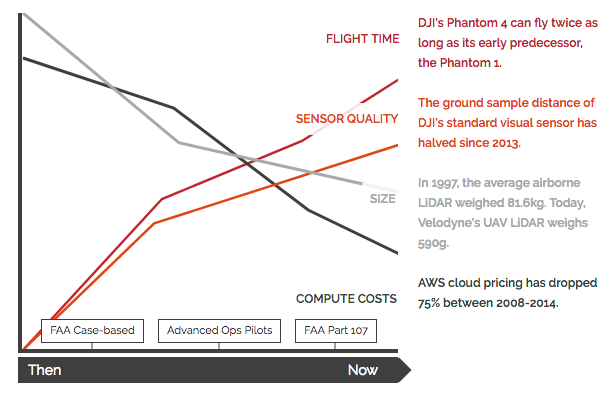 Today, Velodyne’s UAV LiDAR weighs 590 g.
Increasing data processing power: AWS cloud pricing dropped 75% between 2008-2014. Better flight endurance for drones capturing sensor data: DJI’s Phantom 4 can fly 200% longer than the Phantom 1 (released in 2013), while drone manufacturers that are new on the scene, like Birds Eye View, are building drones that can fly for an hour or beyond. Advanced sensors capture specialized data that can be analyzed for business intelligence. They connect with compatible drones and can be swapped out to support a diverse set of business needs. The sensors’ outputs can be used to generate orthomosaics, 3D models, point clouds and digital surface models. They can then be processed by algorithms to identify plant disease, assess water quality, produce volume measurements, detect heat signatures, create surface composition surveys and more. Drone-based advanced sensors help various organizational functions solve problems and make decisions. However, there is some commonality when it comes to the internal business units driving the initiatives. “We have seen internal champions come from two business units: operations and research (especially when surveying is involved). These teams are experiencing an almost immediate return on investment and getting more accurate data than before,” stated David Calderwood, Vice President of Hardware Engineering and Production. 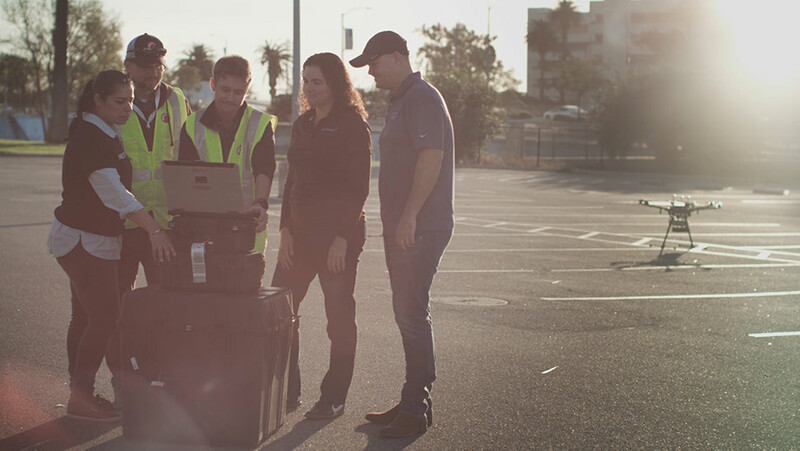 For operations professionals, drone-based remote sensing streamlines the inspection process, keeps workers safe and reduces overall costs. For surveyors and researchers, data collection is accelerated, more ground is able to be covered and data precision improves. “To be successful, identify the problem you are trying to solve first. Think about the data output you need and the insight provided using analytics. 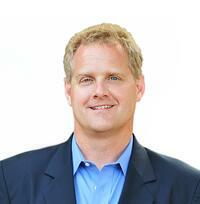 Then, you can focus on finding the right tools,” shared Jamie Young, CP, CMS-L, GISP, Director of Data Services. Start by fully understanding your use case, identify your data requirements and become clear on your desired outcome. Once you have laid this foundation, you’re ready to move forward with researching tools and solutions. “Advanced sensors vary in price and cost typically corresponds to the resolution of the data they capture. Keep in mind, a more expensive sensor may not be needed for your use case,” shared David Calderwood, Vice President of Hardware Engineering and Production. 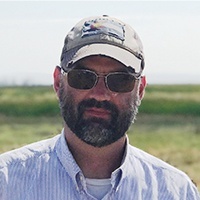 An industry pioneer and author of ‘LiDAR for Dummies,’ Jamie has 20 plus years of experience in remote sensing at leading geospatial firms. The great thing about drone-based advanced sensing is that it’s semi-autonomous. For example, you can setup navigation points to encircle a facility or campus. This makes it so you can repeat the exact same path and capture the same visuals, at the same altitude, with the same sensor package. That’s critical for baselining a facility and conducting change detection. Traditionally, you’d have an engineer looking at data in a spreadsheet. Now, we’re ingesting tons of sensor data and using machine intelligence to identify changes. Overall, drone-based advanced sensing gives you a new perspective—a vision you haven’t seen before. And better, it allows you to speed up surveys, inspections, and other infrastructure processes. This whole technology infusion is helping federal agencies bring more value to their constituents by reducing the costs associated with managing infrastructure, allowing them to invest in initiatives that drive their respective missions forward. Always back up files in at least two different places before leaving the field.